This unfinished object may have been intended to form the lid for a small box. It is one of a group of objects from the workshop of the Swiss engraver, Jean Julien Faucherre (1805-1891). He was born and trained in Switzerland but worked in France from about 1830 to 1841 when he settled in London. In 1857, he was described as a master watch engraver but the surviving material, although including watch dials, demonstrates wider involvement in the silversmithing trade from electrotyped dressing table boxes to engraved panels for carriage clocks. It is very rare to find so much documented material from one of the smaller suppliers to the trade. His work would have been largely anonymous and sold under the name of larger silversmiths or retailers of the Victorian period. 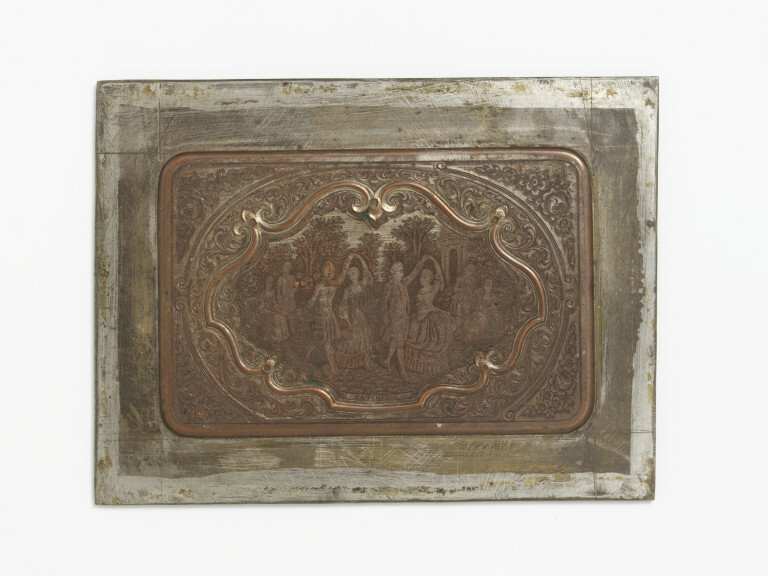 Unfinished rectangular box lid of electrotyped copper attached to a steel plate. 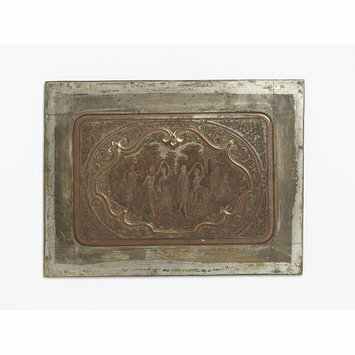 On the lid a design in the central cartouche of ladies and gentleman in eighteenth century costume dancing in a garden.Outside the cartouche a scrolling foliate design. "FAUCHERRE sc " on lid. This is one of a group of objects from the workshop of Jean Julien Faucherre ( M.4- 24 - 2009 ).